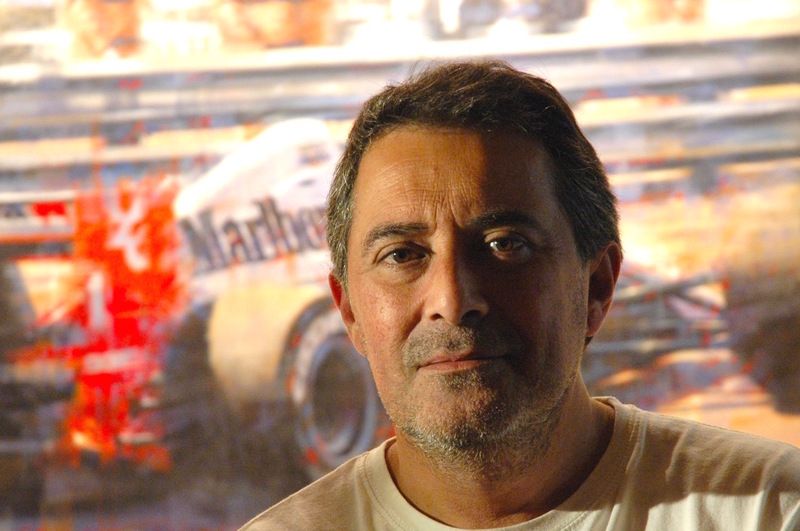 With an impressive network, Juan Carlos Ferrigno has established himself in the automotive art world. Why he is moving in a direction where his heart and passion is. Find out more. I was referred to you by Michele Leonello. Do you know him? Not personally but on Facebook we sometimes have contact. The perspective on your paintings sometimes look very dangerous. I love it. How do you select this when you start a painting? I started working as an illustrator about 35 years ago and in that time, there was no photoshop or anything like that. You had to draw and work with just a few references from pictures. I have drawn a lot of pictures in my life and have always focused on the car. You can see that in my work. There are many details of the car and not always the whole car. Sometimes I do a lot of background, the public, trees, sky etc. and although I like to do this kind of work, I prefer to focus just on the car. The tyre, the speed, the drivers helmet and that kind of thing. Forget about working in a very realistic style and every little detail of the car because otherwise you will be working the whole day. Focus on the motion, the movement and the action of motor racing. Let the viewers see and feel the speed and noise in your painting. Why is that? Sometimes doing background is very interesting but you like to focus on a particular aspect of the car. Well when I was working in Buenos Aires, I went to the fine art school to improve my skill in paintings and there I met a teacher who really liked my work. It was the first time he had seen a student who painted racing cars. It was quite strange for him and he was very interested in my work and gave me the key to future. His advice to me was to forget about working in a very realistic style because otherwise I would be working the whole day. He told me to forget about every little detail of the car and focus on the motion, the movement and the action of motor racing. He said that I needed to get the speed and noise across to the viewer through my painting. That would be doing really good motor racing art. From that experience at school, I changed my style and tried to paint with a knife and thicker brushes and not to be such a tidy realistic painter. I realized that it was what I really wanted to do. You have come a long way in developing your style but is it still developing? Yes. I want to be even more abstract. This is why I like Leonello's style so much. He is so free. I also want to have a freer style and go more to abstract work. I think an artist is always developing. On your Facebook I see that you are also doing very large dimensional paintings. What I would like to do is very big paintings with a lot of colours and a more freer style. The problem is, I also have to think in sales and keep this in mind. On one side, I want to do what I really want to do but on the other side, I have to get clients to buy my paintings. It is quite difficult to sell big paintings. Normally my clients buy smaller sizes because they can hang them in their house and I try to paint in sizes that can be bought by my clients. But my intention is to go for something more artistic, more free with more action and speed. I can imagine that when you are working on a large painting, it is more physical than working on a smaller canvas. Oh yes it is. I just made one of the Porsche 917 and it's more than 4 meters long. It is painted in five different parts. Mainly because if the painting needs to be moved, it's easier than if it was one very big size. When I was painting it, I sometimes sat on the floor painting the bottom of one part. Physically, it's more exciting because in some ways you are fighting against the painting. I notice that you paint mainly cars racing against each other. Why is that? It's just because I love motor racing. No. I don't have a car or a driving licence. My father tried to teach me when I was eighteen but I got so nervous in a terrible traffic jam in Buenos Aires, that I decided to do it later. Time passed and I had some more tries but it never happened. 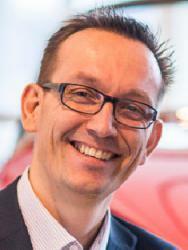 Have you ever sat next to a driver in a racing car and experienced it from inside the car? No, I was never inside a racing car on a circuit. I would love to feel the experience. You put so much emotion into your art work, I assumed you had been in a race. I have a very good relationship with the driver Derek Bell and he said that one day he is going to take me with him in his Porsche 917. I told Derek that it would be something I will remember forever. It's unfortunately not possible in a 917 but in any other car, I would love to go with him and know how it feels to drive at a speed of 300 km. There is one painting you did from inside the cockpit looking over the shoulder of a driver. I painted the 917 and it was on exhibition here in Barcelona where it was driven. I was talking with the owner about the car and I was fascinated. It was such a big moment for me and I took a photo from the inside of the car to do a painting from the drivers point of view. I thought it would be interesting to paint a perspective from next to the driver. I think that if I had the experience of knowing how it feels to go at a very high speed, it would help me paint certain scenes. That would be very interesting and there are only a few artists who have done some racing in their life but not at that level. Yes, the Porsche is for me THE car. When I was ten years old, my father took me to see an international race in Buenos Aires and as a child, I was fascinated. 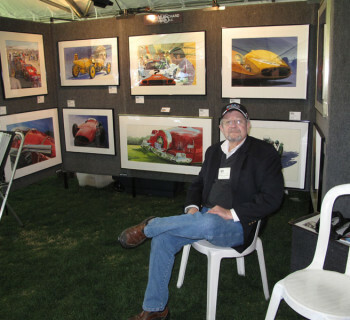 Not only by the cars but from then on, I started drawing racing cars and never stopped. Mainly the Porsche which is the car I love. You expanded your artwork to music and motorbikes. So you have a very broad interest but your main love is racing? Yes, my main interest is motor racing but when I was managed by a company in England, one day we got talking about expanding to other areas. I said music because I love music too. I come from the Rock & Roll time and love the Rolling Stones etc. So we made a program to do an exhibition with paintings of musicians and I enjoyed it a lot. Especially because in some way racing and music have something in common. The sound. You feel the sound and the roar of the car in your stomach when it's in front of you. Music is the same; you feel the music in your stomach and the ground move from the power of the music. On the stage, people like the Stones have a lot of energy and action and colour and it has something to do with motor racing, and suits my style very well. So I started to do music too but my favourite will always be motor racing. I am impressed by your network. You seem to have established your name already in the automotive art world. I don't know. I've been painting cars all my life and have been really surprised at some things which have happened around me. One day the company in England told me they had received a phone call from a publisher (Haynes), saying they wanted to do a book about me and my paintings. I was absolutelyso surprised. 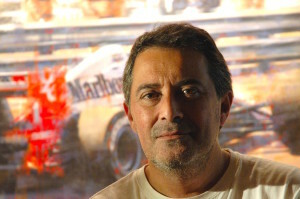 The book was The Motorsport Art of Juan Carlos Ferrigno, my first book. 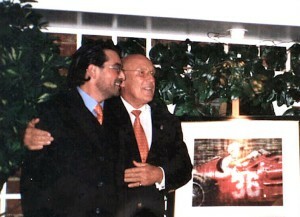 Stirling Moss wrote the foreword of the book and also came to the press release and said such kind words about my paintings. That was incredible for me. From a boy of ten falling in love with a Porsche, I never thought I would someday be an artist. I was just driven because I loved it so much and then there was a very good teacher who taught me all about painting. At eighteen, I could already draw really well with pencil and then I found a job as an illustrator. Then suddenly I came to Europe and found the company in England. Things happened around me which I found impossible to believe because it was all so good. You put a big smile on my face Juan Carlos because I always hear how artists have to paint because it's in them to paint. I always say that a musician will tell you he NEEDS to do it and with painting, it is the same. Sometimes you spend so many hours painting and it's not a problem. You can do it all day if necessary. It's not like a job, it's a need. When do you decide to paint something new and how do you select a topic? What inspires you? 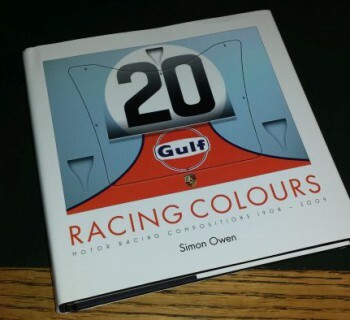 Well if I want to do a painting of Ayrton Senna or say, Le Mans, I look for information. Like what happened in that race; was it sunny or raining and who won the race etc. If I paint Senna, I paint him in Monaco because he was the king driving there. So first you get an idea of what you want to do and then you make a composition, do the drawing and then you put the drawing on the canvas and start painting and let the painting flow. So all the pre-work and study that goes into it is very important to you? Does everything need to be correct like in the original race? When I was working with the British company, they told me that my style was perfect for Formula 1 cars. It was maybe in 1997 and there were not really any good F1 painters at that time. They advised me to focus on it. It was during the time of Schumacher and I started painting F1 cars. From a business point of view, it was very good. We got a lot of clients and we made prints and sold a lot. We did lots of exhibitions and I was very successful with my paintings. Maybe because of my style but also because of the topic I was painting. Then we decided to try different yhings and found that the clients who were buying my paintings really liked to see the car. If I went too abstract, people didn't like it. So I have stayed in the middle doing realistic paintings but giving the painting action and movement and this is what the people like. 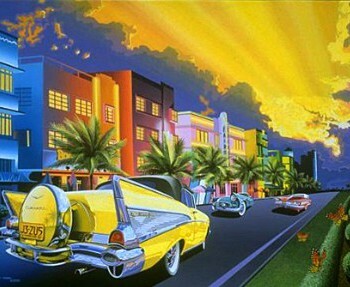 But isn't it the dilemma of the artist that the regular art world doesn't recognize automotive art as Fine Art. If you did move more to abstract, you might be more interesting for the regular Fine Art world but less interesting for the automotive world. I agree but I think this is the way I should go. The problem is that when you have been painting for so many years just in the middle, you cannot change the way you paint from one day to the next. You also have to test yourself to find out what you are looking for and it's difficult to get the time because you are working and doing paintings for clients and have no free time to develop yourself. That is the problem I find now. So although you have the desire to move more to abstracts, you have to stay with what makes a living. Yes, but although I am making a living, I want something more. Sometimes I find people who love my abstracts while other people want my more realistic work. Then I have to manage both. But my head is telling me that I have to go more to abstract and I think this is the way I will go in the future because you have to go where your passion is. It's the same with music. You can play music which is on the music sheet in front of you but it's better to play what really moves you. It must be difficult to move to a different style where your heart and passion lies because it requires bravery and you make yourself vulnerable. Yes but I think my style is developing little by little towards that direction but slower than I would like. For me in the future, I won't paint Senna's car, I will paint Senna' speed. Just as my teacher told me; if you want to do motor racing art, forget about your concept of painting cars and concentrate on painting the speed of the car. The details are not important, you have to capture the speed and tell the people this car is going so fast, they can feel it. If you can do that, you are doing art. An artist should choose what they like doing the most. Tom Fritz is very good because he paints the atmosphere and the light and you feel the heat of the sand. I love his paintings. For me, the most interesting is what you feel when you see the painting of the car. It's good that every artist has his own point of view about art. Do you have a lot of contact with other artists? I keep in touch with my teacher who lives in Argentina. Through the years we have become very good friends. But I don't really have much contact with other artists other than on Facebook. I go a lot to Barcelona to galleries and exhibitions to watch other painters and see what they are doing. It's always good to look at work from other artists and see their different styles. Some artists share their space but I work at home alone, listening to music with my cat. I spend many hours painting or doing things related to my work. When I did my paintings of the musicians, it was held in one of the most prestigious galleries in London and it was huge. I thought I would never be able to do so many paintings to fill the gallery but I finally made 55 paintings. I had to be very disciplined because I had to finish them before the opening night. Then I had to work very seriously. But usually my days are very quiet. I put very nice Rock & Roll music on and the music gives me some push. With music I am able to do things which without it, I am unable to do. Do you work on one artwork at a time or do you work on several? Just one. I know a lot of artists have three or four paintings on the go but when I was an illustrator, I used to work on just one project. In that time you had to respect the deadline for the following week and then you had to work on just one piece and not fail. You don't even think about failing because it just can't happen. You just paint and deliver. I am so used to doing it that way. So I start a painting and finish it. Then I start another one. Have you ever stopped with a painting and put it to one side? Sometimes a painting does go wrong and you don't know why but you feel that it's not a good day. Other days you feel very powerful and can do everything you want. Other times, you don't feel like painting but you still keep painting and then look at it and think 'Oh my God, it's not going well' and sometimes you look at the painting and you just don't like it at all. When this happens, I take the painting and face it to the wall and forget about it for maybe a day. Then after not seeing if for a day or two, you look again and see what it is that is wrong. What kind of advice would you give to new artists who are just starting? Well I was so lucky without even trying. The right people seemed to come into my life but I think it is very good for an artist to first learn how to paint in a realistic way. Then move more towards abstract. Sometimes people think that painting is just putting some colours on a canvas. They don't have the skills. So it's good to learn the skill of how to paint realistically first and then you can do whatever you want. This is how I did it and for me it was very good. To see more of Juan Carlos Ferrigno's paintings, please visit his website.